Or, the answer to a question I never knew needed answering: Why has there never been a Dave & Buster’s location—the hybrid arcade/sports bar entertainment chain—in my home state? They seem to have them everywhere else! There’s at least one in Pennsylvania, which was host to a college senior week event before college graduation at my school. There’s also at least one in New York City that can always be encountered when wandering around. I’ve encountered multiple others when traveling out of state for work. Yet, for their prevalence elsewhere, there has never been one in Jersey. To make things more baffling, there are actually similar places to it here. For example, I live about ten minutes away from a Bowlmor Lanes, a chain bowling alley with a bar that also has an arcade section. (minor though it may be) It’s quite popular, and Dave & Buster’s ought to absolutely play well with the same crowd. So what makes Bowlmor different from Dave & Busters, that New Jersey has room for one but apparently not the other? It’s not been for lack of trying. Dave & Buster’s has eyed the prospect of setting up shop in Jersey for a long time, but there was always one obstacle in the way of making that happen: Their very existence would have been illegal in the state. The culprit was a constitutional amendment from 1959 that was made according to the results from a voters’ question about whether it should be illegal to ban establishments from holding both a liquor license and an amusement game license. “Amusement games,” legally speaking, are games that reward their players with prizes. Casino games, amusingly enough, are not classified under this distinction, perhaps because they directly reward players with money. Rather, the “prizes” in question include things like a stuffed animal that one could win playing carnival games, or—crucial to the topic at hand—tickets, which are awarded from playing games like Skee Ball. Therein lies the answer to why Jersey could have a Bowlmor Lanes but not a Dave & Buster’s. Many of Dave & Buster’s games reward tickets which could then be redeemed for prizes; the games available from Bowlmor Lanes do not. Turns out, that distinction makes all the difference; Bowlmor Lanes would not need to obtain an amusement game license, but that is indeed the case for Dave & Buster’s, meaning they would need to obtain both liquor and amusement game licenses to operate...which they legally could not do in New Jersey. Dave & Buster’s lobbied for years to change that state of affairs, going back to at least 2013, and they recently got their wish. 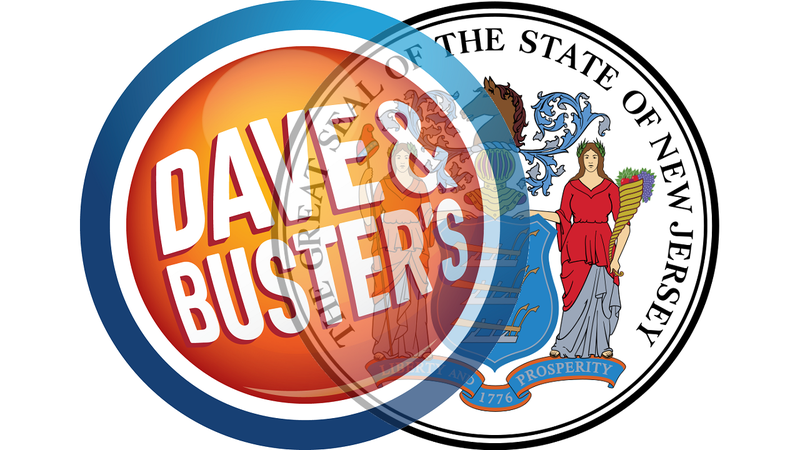 On November 9, 2015, Governor Chris Christie signed a bill into law that carves out an exception from the 1959 liquor and amusement games amendment, which would allow places like Dave & Busters to legally operate with both licenses as long as they fulfill certain square footage and game ownership regulations. A little more than a year later, the goal of their legal victory may finally be coming to fruition, with the first two Dave & Buster’s locations in New Jersey—one in Wayne, the other in Woodbridge—announced as potentially opening up in the last quarter of this year. Enthusiasts of “beer and skee ball” will doubtless rejoice for their arrival. Personally speaking, I’m largely indifferent to this. Dave & Buster’s has been a nice time waster while out traveling, and they could be quite fun with a group of friends or family, but they’re not exactly my style. The big reason for that, funnily enough, is precisely the “amusement games” aspect of their venues. Their preference for ticket-rewarding games means that many of their offerings are either high-tech carnival games or arcade versions of mobile games, i.e. the likes of Temple Run, Fruit Ninja, and Flappy Bird. Those are fun, for sure, but they don’t engage me as much or as long as more “traditional” arcade games. That said, though, I also happen to be spoiled silly on the arcade front. I live close to an old-school arcade—namely, the Eight on the Break, a household name in its own right—complete with all of the rhythm and fighting games and fried foods to satisfy my little heart. Such places are a genuine rarity, however, so it’s nonetheless cool on a conceptual level that there may be more arcades coming to the state.